“What would happen if you broke this rule in this game” jokes are rarely very clever, but this idea tickled me enough to warrant a draw. Why not, eh? 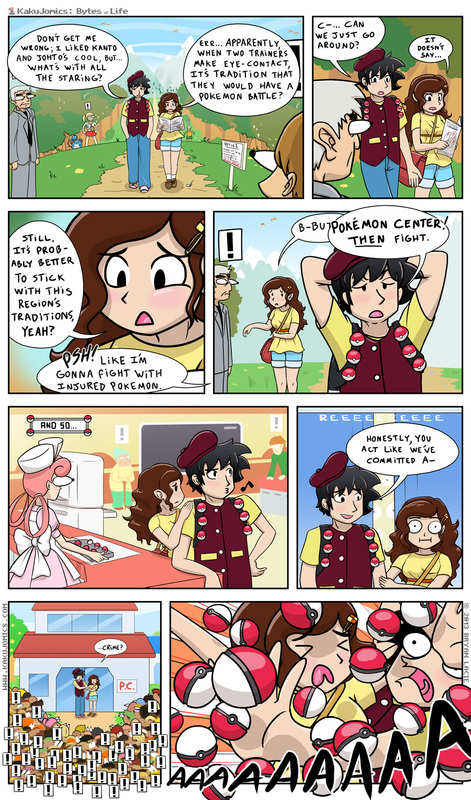 ‘Dem shiny Pokeballs in the last panel? I’ve learned that it’s always good to set aside at least one game for yourself, if you’re an LP’er. Otherwise, you’ll go craaaAAAaazy~ Darksiders is my current personal romp, and I am in NO way disappointed. Some would critisize it for being too “generic”, but it’s a solid bunch o’ fun. Tenoreo and I are also playing Ni no Kuni, whenever we get the chance. It’s definitely a JRPG. I’m not saying it’s boring or anything, it’s just classic in the sense that it’s usually better vegged out to as a solo experience, in my opinion (no offense, Dear). Life is life and that’s life. IS THIS PROFOUND ENOUGH FOR YOU!? But seriously, I finally got a good guitar! I’ve played since around 2004, but I’ve never owned one that cost more than $100, and I was always frustrated with the fret buzz and ridiculous action on these things. I ended up with a Fender Mustang, and I’m really liking it, though it might have some loose solders that need melting back at the shop. The Pawn Shop series Mustang is hardly like the original, apparently, but it is incredibly diverse in how you can set up the pickups. The accompanying amp I got doesn’t allow for very lucid tones, but a second amp is just something I’ll have to aim for, in the future. I been playin’ The Pillows all up in this place. I love how Tenoreo looks so terrified in this, it makes me giggle!